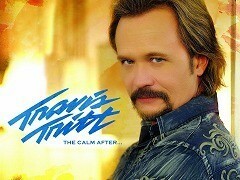 Travis Tritt finally secured the rights to master records of his 2007 album "Storm". He'll release an updated version of the album in July renaming it from "Storm" to "The Calm After". There's also a new track on the album, which is a duet "Sometimes Love Just Ain't Enough" with Travis' 15-year-old daughter Tyler. Travis Tritt described how the duet came to birth. He and his family were going by car, when the song "Sometimes Love Just Ain't Enough" by Patti Smith and Don Henley came up on the radio. His daughter Tyler started singing along and Travis, astonished by her singing, decided to take her to the studio and cut that particular song as a duet. The new song with his daughter is also Travis' new single. Travis Tritt & Tyler - "Sometimes Love Just Ain't Enough"